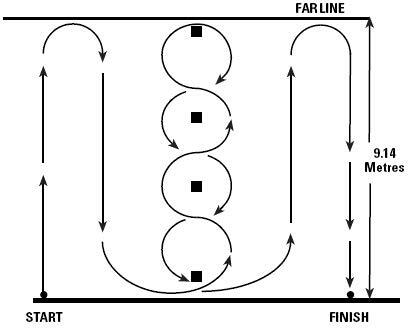 The diagram below shows one version of the Illinois Agility Test. Please note that some police tests are known to use a slight variation on this where you run ‘around’ cones at the top end of each straight run. This is also shown in the video above. If on the day, the turnaround point is a line (instead of a cone) you will likely score even faster as you don’t have to run ‘around’ anything there. However make sure you listen to the instructions and cross the line when turning as directed!